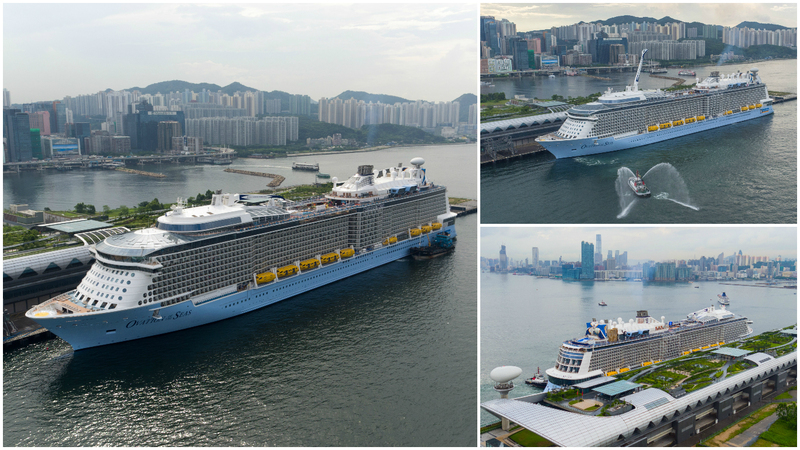 As Ovation of the Seas has reached the final leg of her 52-night “Global Odyssey”, culminating in her arrival to her homeport in Tianjin, China for a naming ceremony officiated by the first ever Chinese Godmother Fan Bing Bing, Royal Caribbean has realesed some new pictures of the ship’s arrival in Hong Kong. The grand entrance of Ovation of the Seas into Hong Kong on June 17, 2016 was marked with a prestigious ceremony graced by senior government dignitaries and key industry stakeholders. The event paid tribute to Hong Kong’s achievements and those of Ovation of the Seas in five specific areas: Technology, Art, Culinary, Entertainment and Sports. Royal Caribbean presented trophies to five Hong Kong celebrities who have achieved regional or global acclaim in these five areas. 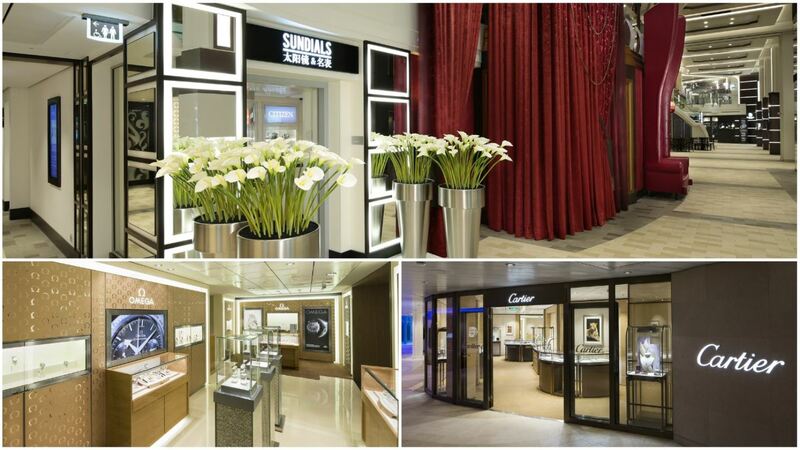 Following the ceremony an extensive tour of the ship enabled the guests and dignitaries to experience first hand some of the unique Quantum-Class innovations paralleling the five achievements of Hong Kong that Ovation of the Seas offers. These include the North Star aerial observatory, a glass capsule lifting guests more than 300 feet above the ocean for incomparable panoramic views; the RipCord by iFLY skydiving and FlowRider surfing simulators; VOOM the fastest internet at sea, and SeaPlex, a unique multi-purpose sports complex enabling a variety of activities, including bumper cars. 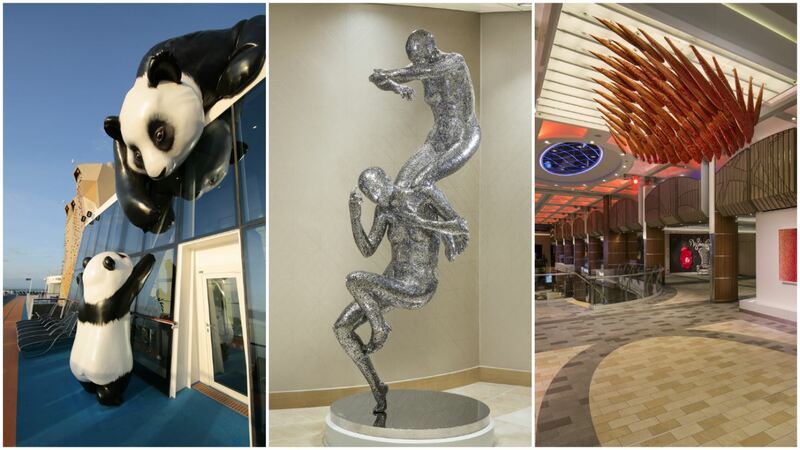 The ship also features an iconic on-deck art piece of a giant panda “Mama and Baby”, which is considered a symbol of good luck and a national treasure in China. 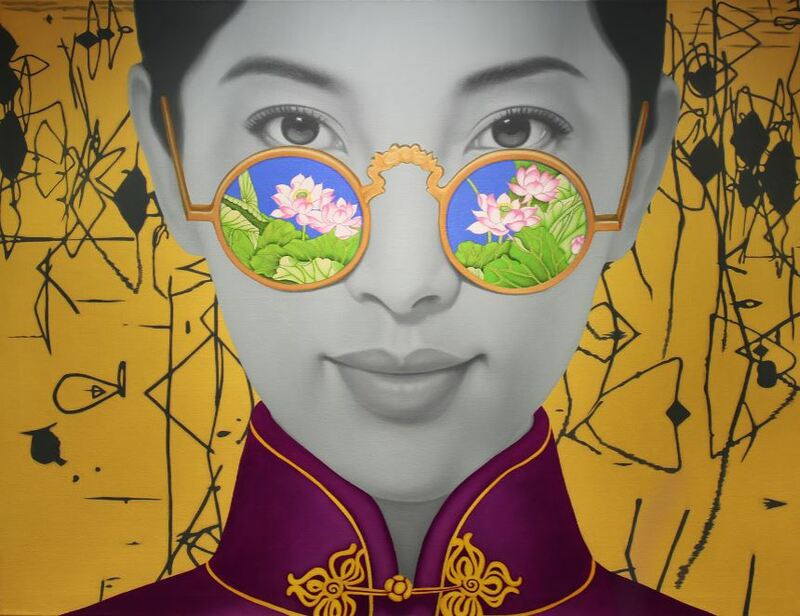 Ovation also offers an extraordinary exhibition of art from the Forbidden City Palace Museum in Beijing (a first on any ocean going cruise liner) together with an exceptional range of 18 culinary offerings including a Jamie’s Italian restaurant from the celebrity chef Jamie Oliver and Wonderland, a whimsical restaurant with an elaborate feast for the senses. 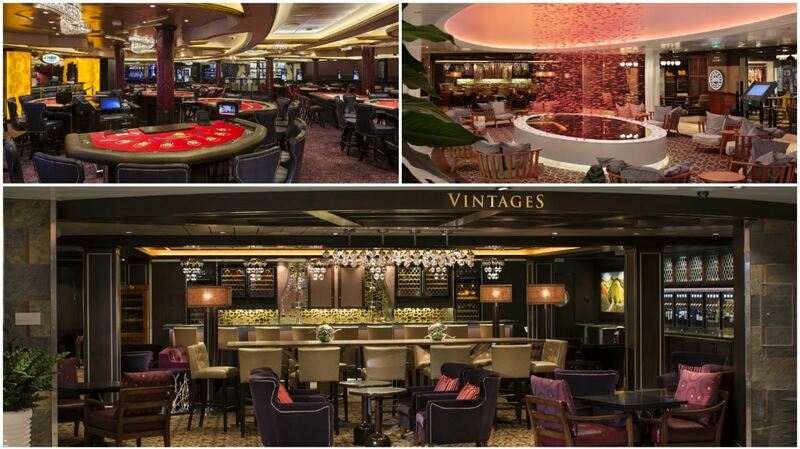 Guests were also able to see the 1,300 seat Royal Theatre and the Music Hall where Ovation of the Seas hosts Tony-award winning Broadway shows and Las Vegas style theatrical productions. For more pictures and a full review of our visit to Ovation of the Seas see our previous post Ovation of the Seas – a visit. At the end of October, Ovation of the Seas will homeport in Hong Kong for a season of five cruises to destinations such as Japan and Taiwan. 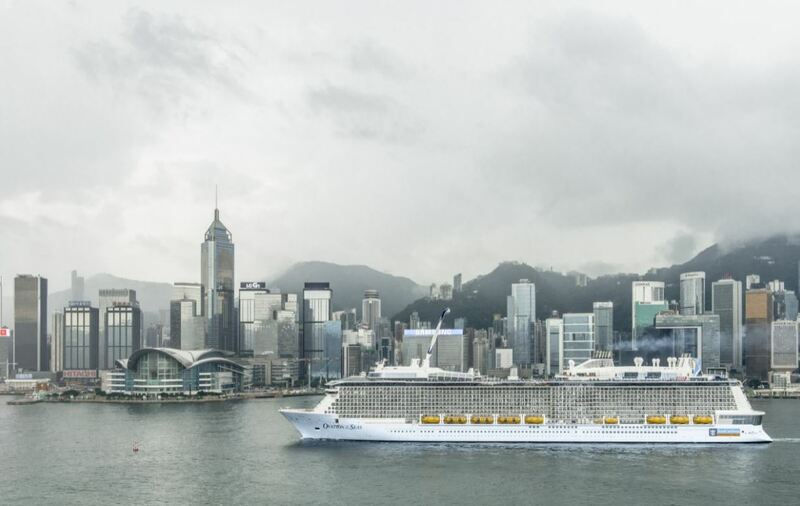 It will be the first time that Royal Caribbean has two ships homeporting in Hong Kong at the same time. 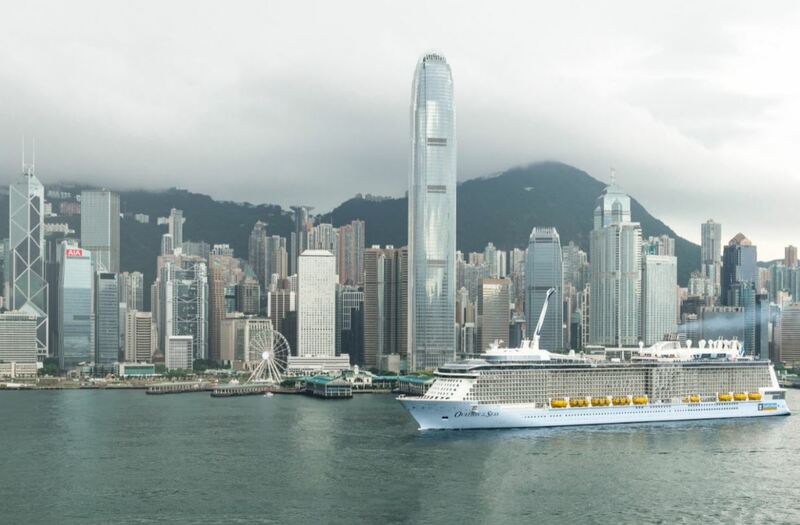 Having both Voyager of the Seas and Ovation of the Seas there will enable Royal Caribbean to increase their total Hong Kong sailings from 20 to 30 welcoming over 100,000 vacationers.